Greenham Common Women’s Peace Camp was a 19-year anti-nuclear protest and encampment at the U.S. Military Base at Greenham Common, Berkshire County, England. 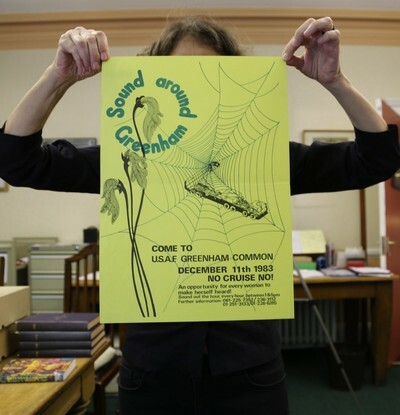 This exhibition and event series, organized as a mother/daughter collaboration between Susan Jahoda and Emma Jahoda-Brown, assembles accounts of the comings and goings and daily lives of a diverse group of women at Greenham primarily over a nine year period. Photographs, film, artifacts and sound are brought together to reveal a complex view of a largely invisible history. This project honors the visual work of Susan Kleckner and the extraordinary women of Greenham Common who transformed a space — otherwise claimed for militarism and colonialism – into a place of protest, agency, and exploration of feminist politics. Women traveled to Greenham Common from all over the world and supported the movement from their own geographic regions, marking it as the largest women’s campaign since the early twentieth century struggle for suffrage. Organized by Susan Jahoda and Emma Jahoda-Brown, with contributions by Rachel Mattson and Blithe Riley.